The shell, or pressure vessel, with an inlet and outlet, is normally a flanged cylinder fabricated to industry standards. 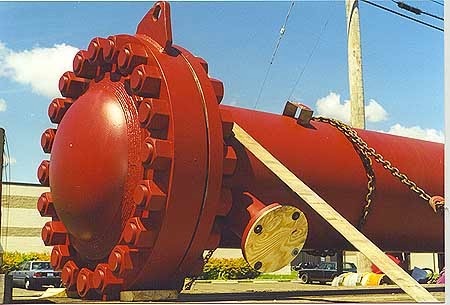 A flanged tubing bundle, with its own inlet and outlet, is then inserted and bolted in to the vessel. The fluid circulating in the tubing bundle is generally the energy source and is intended to increase (heat) or decrease (cool) the fluid circulating in the vessel. Both the shell and the tube bundle are available in a wide variety of metal alloys, the selection of which depends on the fluids being heated or cooled, and the atmosphere in which the shell and tube exchanger is located. Accessories such as control valves, steam traps, condensate traps, pumps, level controls, flow meters and temperature controls are used to complete the thermal loop. Shell and tube heat exchangers are very important part of chemical and petrochemical industries, with chemical manufacturing being the largest user of shell and tube heat exchangers. Other industries relying on them are petrochemical, oil & gas industry, pharmaceuticals, power generation, HVAC, food & beverage, refrigeration, and pulp & paper. 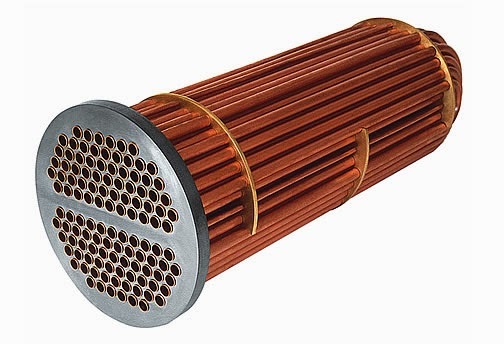 Considerations for selecting a shell and tube heat exchanger are materials of construction, temperature range, fluid type, pressure classification and environment. Aside from shell & tube designs, other heat exchanger designs are plate & frame and air-cooled. Calculating the thermal load and heat requirements to properly size a shell and tube heat exchanger can be challenging. Additionally, there are safety considerations due to pressurization. Because of this, it is highly recommended that a consultation with an applications engineer be done before specifying.